Gianfranco Pieri, born on February 6th in 1937, has been of the great Olimpia stars coming from the talent hotbed of Trieste. He was probably the first great modern point-guard in the history of Italian basketball. Cesare Rubini, obviously, was the one who badly wanted Pieri to come to Milano, after a 34-point outing against Olimpia, at 18. It was the best way to convince someone it’s much better to join you than to fight you as an opponent. It happened in 1955 when Pieri’s father left Trieste and moved to Milan in a job-related move. At that point, the team was already established as a powerhouse, but Pieri allowed it to extend the cycle and nurture the legend. In November 1955, he made his debut with the Nation team, at 18, in 1957 Pieri won his first championship and was considered by many the best player in the entire league. 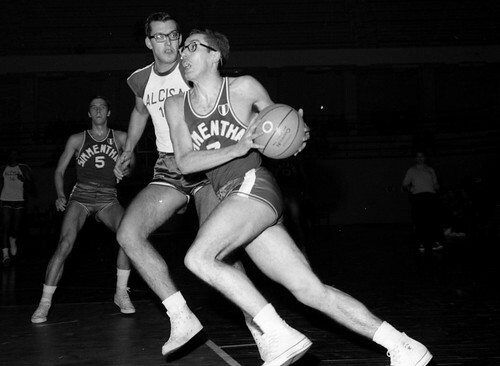 From that point on, he never stopped himself, won nine championships, made famous the glasses he used to play with, was nicknamed The Professor, played the 1960 Olympics and returned for the 1964 edition, was Olimpia’s starting point-guard in 1966 winning the first Champions’ Cup. He’s now obviously a member of the Italian Hall of Fame. Pieri has been the pioneer of an history of point guards of extreme quality in Olimpia: after him, there’s been Jellini, D’Antoni and Djordjevic or Gentile, some of the best in Europe. Pieri was a nice shooter but his trademark was the passing ability. He used to play with his head up while dribbling, seeing everything on the court and he also had an imposing height for his position and that era, 1.91.